“We are all travelers. We seek what is true and we push past what we know to be false. The question is: where to go? What place is true and good and real? Where is the place that will speak to us, crystal clear, in a voice that is familiar and kind? New Mexico is True. Experiences here are authentic, whether from the cultures that have lived here for centuries, the landscape that offers variety found nowhere else, or the people who are genuine and friendly. New Mexico isn’t about plastic replicas, papier-mâché attractions, or contrived adventures. All five senses will tell you this is a special place; will inform you that you have discovered a unique part of the world. New Mexico True. Click HERE to view tips for completing your Ad Content Execution (ACE) Form. 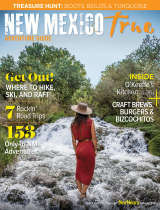 See examples of how the New Mexico True Brand has helped our partners improve their advertisements.